Since 2009, rebeam is the specialist for the purchase, sale and quality-assured maintenance and repair of used projectors. rebeam is your expert for second-hand, technically perfect high-performance projectors for events. 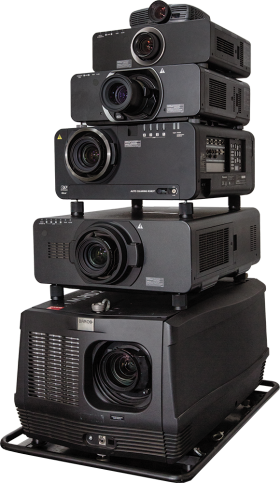 Our portfolio includes more than 500 projectors from renowned manufacturers such as Panasonic, Barco, Christie, Epson, Digital Projection and many more. We have a large selection of over 800 lenses, flying frames, cases, lamps, accessories and spare parts from 1st and 2nd hand with warranty permanently in stock. We offer also a large selection of used displays and LED walls. 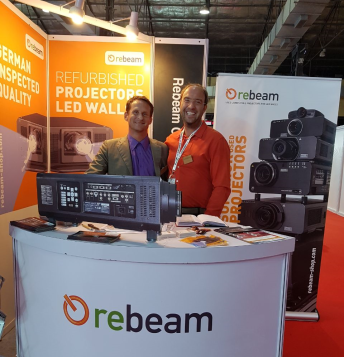 Founded by Jonas Huber and Jan Schulte, rebeam has quickly developed into the leading company for the recycling of projectors in Europe. 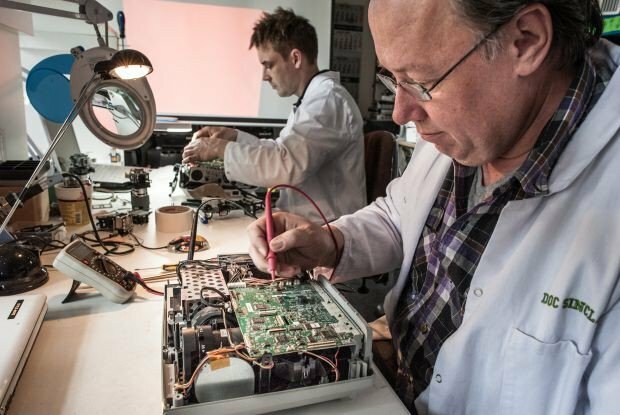 Thanks to innovative recycling methods, several thousand used beamers have already been reprocessed for a "second life" in Europe's home theatres or have been disassembled and recycled in an environment friendly manner. Our passion for our work and products refelects on recreation. In 2013 rebeam converted into an independent limited liability company. In 2017 rebeam was awarded for the first time by the Sustainability Council of Project N for the refurbishing of beamers . While we used to concentrate on small projectors and project motors up to 5000 ANSI lumens, today our heart beats for event projectors. Our know-how has grown enormously since then. And so is our portfolio: Media servers, displays, LED walls and lenses. Projectors for fixed installations, trade fair appearances, video mapping, large stages or guerrilla marketing. Over 500 projectors from well-known manufacturers such as Panasonic, Barco, Christie, Epson, Digital Projection and many more are available in our shop. We can currently offer the appropriate technology for all lessors, theatres or event locations. We know that a solution often does not fit everyone and work with our customers to develop tailor-made concepts that meet their individual needs and requirements. Please feel free to contact us, we would be delighted to help you. We give 3-D Mapping Event, Video Mapping, Hologram, Water Projections and consulting services. In Germany we have very high quality and maintenance standards and a very short life-cycle for technology. Many machines get replaced whilst beeing the current top model and still beeing covered by manufacturers warranty. This is entirely beneficial for you! We like to see ourselves as projection enthusiasts and professionals. Our goal is to offer our clients the widest range of high-performance projectors in the used and refurbishing market worldwide. Germany is the perfect location to operate from since almost all large international video projections are done with german experts and german technology. To complement the purchase of event projectors, we offer in addition a manufacturer independent repair, cleaning and maintenance service for large-scale equipment. 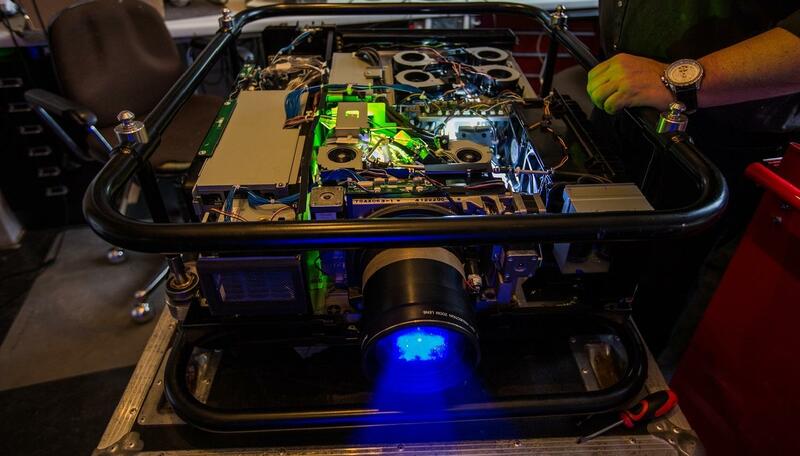 Our technical department has many years of experience in dealing with projectors for event technology - as well for equipment that is no longer common to purches (EOL equipment). With our large stock of spare parts, we often find the right projection solution for special events. If repairing is no longer possible at all, we recycle the functional parts and we take care of the disposal in a environment friendly way. Whilst servicing a projector we offer a replacement device, in addition we offer express repairment service (less than 3 days). For us, sustainability is not a new-age phrase, but a corporate philosophy that we put into practice. We ship with UPS Carbon neutral or shipping companies that are also involved in sustainability. We use 100% green electricity and use compostable packaging material and recycled paper. Our communication technology often consists of refurbished, used equipment. Business trips are preferably carried out in a CO² neutral manner and bicycles are almost always our employees vehicles. In the heart of Berlin-Kreuzberg our team of 15 people works every day with a lot of fun and commitment to offer the best service and products for our customers. Many of our employees work with us on a part-time basis in order to maintain a balanced work-life balance. With regular training and internal workshops, we not only strengthen our team spirit, but also our expertise in projectors. If you are interested in working with us: Your unsolicited application is welcome.